Talking Temp Digital Thermometer | Patio and Hearth Co. This thermometer has settings for beef, pork, and poultry, as well as a neutral setting. Inject this flip tip probe of the thermometer into your protein, hit the corresponding setting, pull the trigger, and the thermometer will announce the temperature of the protein and whether it is done cooking (“pork, 140 degrees F., done”;”chicken, 165 degrees F., done”) or “chicken/pork/temperature/not done”. The digital screen will also display this information. In the case of beef, the thermometer will announce the temperature and the digital screen will let you know how well-done your steak is (Ex, “Beef, 125 degrees F., medium-rare.”). 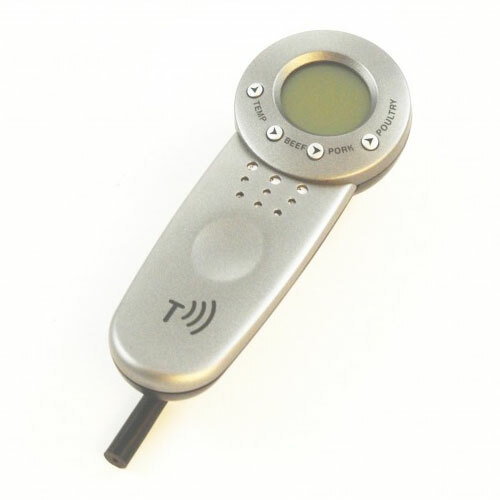 It has a large-digit, backlit LCD display and uses two replaceable AAA batteries (not included). Inquire about Talking Temp Digital Thermometer using the form below.